TROPHY, the critically-acclaimed film exploring big-game hunting and wildlife conservation, will premiere as a CNN Film Sunday, Jan. 14 at 9:00pm Eastern & Pacific, with limited commercial interruption. The film is directed by award-winning photojournalist, cinematographer, and filmmaker Shaul Schwarz and co-directed by award-winning photojournalist, cinematographer, and filmmaker Christina Clusiau. From the film’s opening images of an American father and child hunting together in Texas, the filmmakers immediately frame the multidimensional nature of the controversy at the heart of the film. Character stories featuring hunters, anti-poaching security officials, reserve owners, animal welfare organizations, government officials, and hunting clubs establish why the intersecting issues are rippled with emotion and, in respect to those species which are endangered, the issues are also urgent. “We wanted to explore the idea of what it means when we place economic value on wildlife. Could it be a tool to help conserve wildlife populations or does it hinder conservation efforts?” asked the filmmakers. TROPHY takes viewers on an international visual safari, visiting the countries that are home to the ‘big five,’ the African wildlife most-prized by big-game hunters: lion, buffalo, rhino, leopard, and elephant. Pausing at the conference for Safari Club International (SCI) held annually in Las Vegas, the film lingers at exhibits for hunting outfitters, guns, taxidermy services, conservation seminars, and safari licenses. SCI, which attracts 20,000 visitors from around the world each year, hosts this broad array of interests and businesses, all at the same convention. Since just 1970, the film says the world has lost more than 60% of all wild animals, and some species seem to have fared even worse. Populations of elephants have plummeted from 10,000,000 animals in 1900 to 1,300,000 in 1979, to only 350,000 elephants in 2015. In 2008, the year prior to South Africa’s moratorium on the sale of rhino horn, 83 rhinos were poached. In the year after the ban, 333 rhinos were poached, and in 2014, more than 1200 rhinos were illegally killed. Extraordinary aerial footage of vast African vistas shown in the film is interwoven with close images of swaths of cultivated lands. The film demonstrates that while hunting and habitat encroachment have an impact on wildlife reduction, it’s poaching, often connected to both corruption and terrorism, that’s having the most dramatic and deleterious impacts. 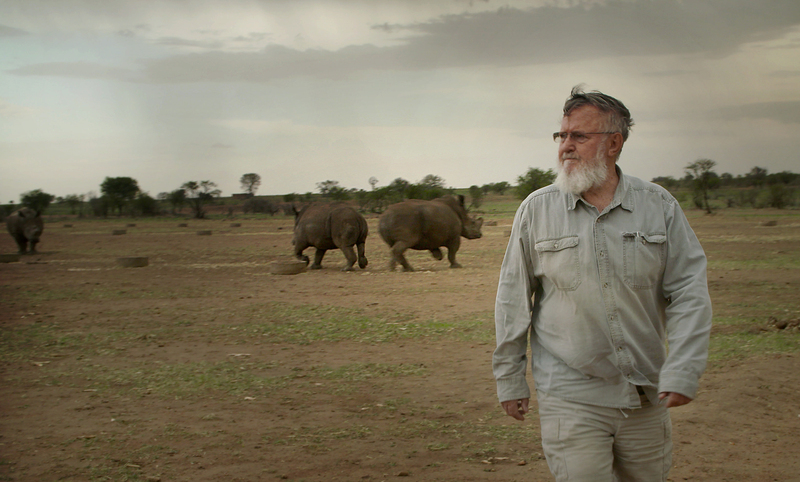 John Hume, owner of the world’s largest rhino breeding reserve, sees harvesting the horns from farm-raised rhinos as integral to saving his beloved animals. Rhino horn is “more expensive than gold or heroin by weight” Hume says. But, Hume asserts, animals do not go extinct while farmers can make money from breeding them. Hume’s procedure for harvesting rhino horn keeps the animals alive and re-growing more keratin horn. Hume feels that if he can demonstrate that raising rhinos and safely harvesting their horns offers an income, others may also similarly cultivate the animals, and thereby rescue them from being endangered. Ecologist Craig Packer believes Hume’s farm is a potential model success story for saving the rhino. The film explores most of the challenges of balancing conservation, sport, human population growth, and the commerce associated with big-game hunting. Central to TROPHY, are the open questions of the appropriate economic value of wildlife. The film leaves the unanswered questions for viewers to ponder. During the Jan. 14 premiere, TROPHY will stream live for subscribers via CNNgo (www.CNN.com/go and via CNNgo apps for AppleTV, Roku, Amazon Fire, Samsung Smart TV, and Android TV) and on the CNN mobile apps for iOS and Android. The film will be available beginning Monday, Jan. 15, on demand via cable/satellite systems, CNNgo platforms, and CNN mobile apps. TROPHY will encore Saturday, Jan. 27 at 9:00pm and Sunday, Jan. 28 at 1:30am Eastern. CNN Films, now celebrating its fifth year, produces and acquires documentary feature and short films for theatrical and festival exhibition and distribution across CNN’s multiple platforms. Amy Entelis, executive vice president of talent and content development for CNN Worldwide, oversees the strategy for CNN Films; Courtney Sexton, vice president for CNN Films, works day-to-day with filmmakers to oversee projects. For more information about CNN Films, please visit www.CNN.com/CNNFilms and follow @CNNFilms via Twitter.